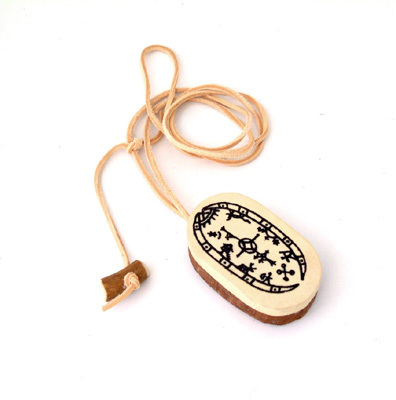 Complete in every detail this Sami Shamanic Drum pendant makes an attractive and unusual gift. Supplied in a perspex presentation case. Size: 1.5 x 3.5 x 6 cm. A Sami Shamanic or Lapp Witch drum made in Finland in the traditional way using a birch frame with reindeer skin for the head and antler for the beater. The design is also traditional showing a cosmic map of the universe to assist the shaman in his journeying. Below there is the world of the departed, in the middle that of people and above that of gods and spirits. From the central point rises the sun the life giver for all living.By beating his drum and performing a spiritual singing technique known as jojk, the shaman went in to the trance state. And during that state his free-soul left the body and travelled to the spirit world. The Sami who once watched their shamans and drums burn during the Christian inquisitions are back beating drums and performing jojks, a vocalization practice that is considered one of Europe's oldest living traditions. Complete in every detail, this Sami Shamanic Drum pendant makes an attractive and unusual gift.